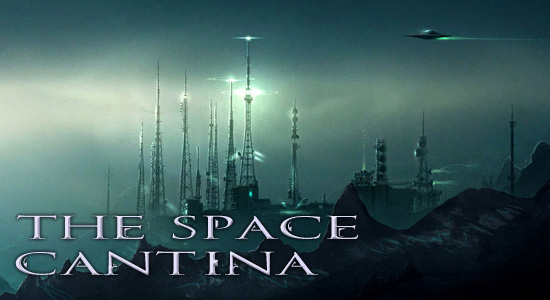 Welcome to the first installment of The Space Cantina, the place on my blog where I basically talk about writing, the writing business, or something completely nerd-tastic. Tonight I want to talk to you about Fan Fiction and why I think it’s pretty awesome. Also, I’m listening to songs from the 90s, which is similarly awesome. When I was 14 years old I got my very first computer. With that computer, I also bought the game TIE Fighter. My dad spent a couple of hours getting the damn thing to work, mucking around with SoundBlaster drivers or some such (remember when we had to do such things in DOS? The future is great isn’t it?). Okay let’s fast forward ahead a few months. In my mind it’s forever, but when you’re 14 everything is forever. My first break-up? Traumatized. Anyway, this game had me in its grips like some tentacle creature from Gorab 9, devouring my brain and filling it with tons of awesome crap. At the time I didn’t know it, but I was beginning to tell my own stories. I imagined how I might do things differently, how I’d react if I were Maarek Steele and flying for the Emperor. Around this time I joined an online gaming group called The Emperor’s Hammer and then the New Republic, who were basically a bunch of guys who played the same game I did. We made up fictional pilots and wrote back-stories for them, shoved them into fictional squadrons and had an amazing time pretending it was all very real. Then we created a newsletter and in each newsletter we printed stories. I wrote my very first one when I was 15 years old. It was horrible and full of laser blasts and impossible events, but you know what was fantastic? At 15, no one told me I couldn’t do it. I wrote it and they put it in the newsletter and other 15 year old kids like me read it. They liked it, so I wrote more. I wrote an entire series of adventures with a character I so imaginatively named “Miek Kenr.” In case you were curious, that’s just my first and last name rearranged. Don’t tell anyone that Lee is just my middle name (and my pen name to avoid fictional stalkers that I pretend are there). I was 15 years old and I wrote 10 chapters of 3000 words. I’m not saying this to brag in any way, shape, or form. What I’m saying is that I wrote that much because I was having fun and the ideas kept coming. I didn’t really consider myself a writer back then, I just wanted to experience Star Wars in my own way, so I wrote the adventures I wished I could read about. It was later, much later, when people said “Hey, Mike, you’re pretty decent at this, have you thought about being a writer?” that I considered it. Until then, I was having adventures in a fantastic world George Lucas gave me to play in. Without that world and that desire to have those adventures I would have never ventured in the world of fiction. I was able to plot and develop characters without the need to create my own world and develop all the scenery. What it let me do was practice without realizing I was practicing. I evolved from those dreams of flying X-wings and TIE Fighters into writing new characters in new places within new universes of my own. Without the support of that existing sandbox, I’m not sure I could have developed plot and characterization at that time and had it come off as anything more than stilted renditions of myself. I believe in Fan Fiction as gateway drug, a first sip, that playground where all the kids are just as new as you are. Step into that world and take the gifts that are there for you, a world you already know and a story structure you already understand. Use that framework to build your own stories and your own characters. Make them unique and full of complexity even if you think you can’t. Try. If you fail, so what? No one will tell you that you can’t try and if they do, they’re idiots and not worth listening to. I hear you internets, I know about the slash-fic and the Fan Fiction out there that just pits X against Y or has X fall in love with Y. That’s fine too, but if you’re going to do that, use what exists (world, rules and characters) to develop your plotting skills. Make it interesting, make it your own. I believe in Fan Fiction because you already love the world you’re writing in. I’ve killed half a hundred worlds of my own creation because I hated them. I threw them into fires of disgust and burned them all into ashes of irritation, and I’ve been writing for a long time. It’s hard, I know, but you’ll get there. Until then, if you have an idea about flying TIE Fighters, fighting Husks or punching Diablo in the face then don’t feel afraid to write it. No one can say you can’t. I still write it, take a look through my blog if you don’t believe me. I got started there and I’m not ready to give up on all those people who gave me the courage to write those first words. I believe in Fan Fiction. I hope you all will too. This entry was posted in General, Space Cantina and tagged awesome, believe, Fan Fiction, gaming, Michael Lee, miek kenr, sandbox, space cantina, star wars, tie fighter, writing, x-wing. Bookmark the permalink.